Whether you’re traveling to the capital of Czechia for work, to study, or just for a trip, renting an apartment in Prague 4 is child’s play with Flatio. Reserve it for 14 days, a month, or the whole year. Where can you get a rental in Prague 4 quickly and simply? Check out our map and search for your dream home easily with the help of the Flatio team. Take a look at the newest rentals on Flatio and never miss out on a great offer again. Find, with the help of our team, the ideal accommodation in Prague 4 for 14 days, a month, or half a year. Examine the chosen apartment with the help of virtual tours at your own pace, make deciding easier. You’ll have everything sorted fast and without delays – no later than 24 hours after reservation you will receive a confirmation from the landlord. You only pay 19€ reservation fee and a service fee based on the length of your stay. 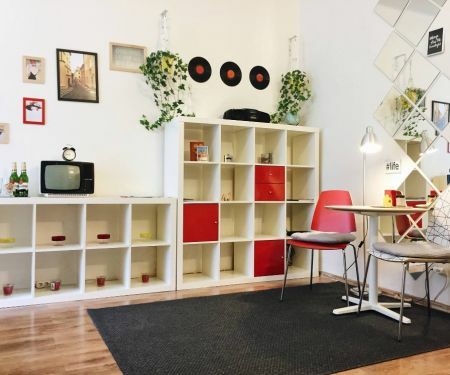 Thanks to Flatio, you’ll have a mid-term rental in Prague 4 in the bag. Are you looking for a rental in the capital of Czechia for 14 days, 4 months, or maybe the whole year? 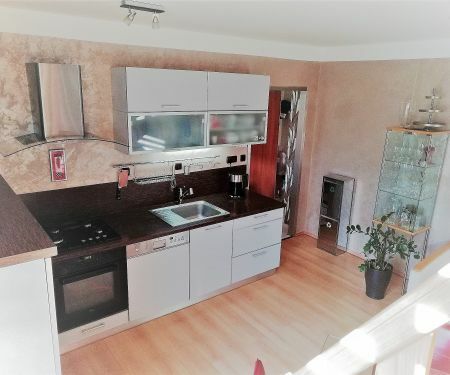 Pick the ideal apartment in Prague 4 for you on Flatio. The advantage is that the centre will be only a few-minutes’ ride away. Although, even Prague 4 has a lot of culture for you to experience – you can dine in one of the many restaurants and then go see a play in the Smetana Theatre. Prague 4 has an area of 24.22 km². According to data from the year 2017 it has 128 455 inhabi­tants. Do you want to be one of them? You can rent a fully furnished apartment in Prague 4 with the Flatio team’s help. And you can do all that without having to pay a deposit. Arrange your accommodation in the capital of the Czech Republic with the Flatio team. Pick a mid-term or a short-term rental for 14 days, 4 weeks, or 6 months and choose from the best apartments in Prague 4, the ideal one for you. On our website, every offer has ratings by previous users so that you can decide not only based on our virtual tours and attached photos but also based on real-life experiences of previous tenants with the chosen apartment. With our team it’ll be simple and fast; 24 hours after requesting reservation at the latest, you’ll know if the chosen rental is yours. Have you chosen Prague 4 as the ideal location for your upcoming stay in the capital of Czechia? Get a short-term, mid-term, or a long-term rental on Flatio. Make the reservation from anywhere in the world with an internet connection and in 24 hours you’ll know if the chosen rental for 14 days, a month or half a year is yours. Travel to Prague for 14 days and stay in a home-like environment that you can choose ahead of time. On Flatio, you can easily rent an apartment for two weeks in Prague 4. No deposits, estate agency, or steep commissions. Are you going to stay in the capital of Czechia for 4 weeks and you want to live somewhere other than overpriced hotels or boarding houses? 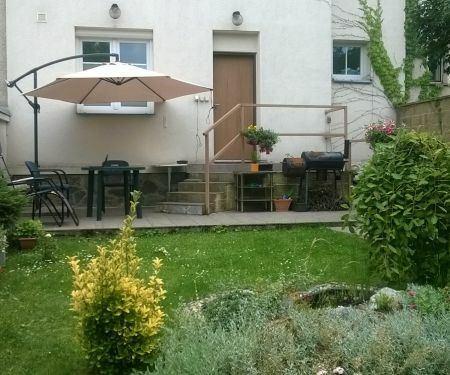 Rent an apartment for a month in Prague 4 on Flatio. Everything is fast and without deposits. Do you want to rent an apartment in Prague 4 for 6 months? It’s not a problem with Flatio. Use virtual tours and a rich variety of photos and even you can have your ideal accommodation in the capital of the Czech Republic. On Flatio, you can rent an apartment in Prague 4 for 12 months without a deposit; in just 24 hours. You only pay the reservation fee of 19€ and a service fee based on the length of your stay, and it’s yours! Get a rental ahead of time for 2 weeks, a month or a whole year in the capital of the Czech Republic. The municipal district, Prague 4, is only a few minutes away from the city centre. You can make the reservation from anywhere in the world and in 24 hours at the latest you’ll know if you can count on it. without a deposit or estate agency. On Flatio, renting an apartment in Prague 4 without an estate agency or steep commissions for the agent is no problem. Our team can do it without all that! You only pay 19€ reservation fee and a service fee based on the days/weeks/months you’ll spend in the capital of Czechia. You want to live in Prague for 14 days or even half a year? If you don’t want to stay in expensive hotels or boarding houses and you prefer a home-like environment, turn to the Flatio team. They will secure for you a short-term or mid-term rental of an apartment in Prague without deposits and within one day of requesting reservation.